Given their apparent influence on spine maturation and the trafficking and function of synaptic components, cadherin synaptogenic functions may be intimately tied to nascent activity patterns. 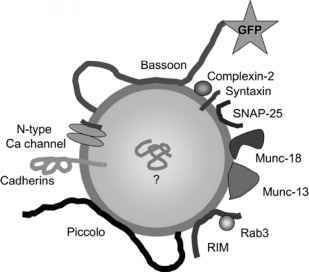 These functions also have obvious implications for synaptic plasticity at later stages. Indeed, CA1 LTP induced by tetanic stimulation is augmented in hippocampal slices from adult cadherin-11 deficient mice relative to wild-type controls53. Although cadherin-11 function was chronically absent throughout the development of these animals, acute perturbations support more immediate roles for individual cadherins in mediating plasticity. Manipulating E- or ^-cadherin function, with function-perturbing antibodies or adhesion-blocking HAV motif-containing peptides, can prohibit the maintenance of long-term potentiation (LTP) or even occlude its induction in the CA1 region of hippocampal slices47. Cadherins can also mediate morphological plasticity at mature synapses. For instance, transient spine head expansion following KCl-mediated depolarization in three-week cultured neurons is restricted by the expression of ^-cadherin mutants either lacking the extracellular domain or carrying a point mutation that abrogates homophilic binding54. As with maturation, individual cadherins may coordinate these functional and morphological changes at mature synapses. In some sense, the calcium-dependent adhesion conferred by cadherins in these cases may serve as both a structural index of synaptic strength at a given time and an activity-dependent modulator of synapse composition. As such, cadherins themselves appear to be dynamically modulated by activity. Hippocampal neurons maintained for four to five weeks in culture show a transient lateral dispersion of both ^-cadherin and synaptophysin following a brief depolarization of by KCl application25, which is thought to produce concerted neurotransmitter vesicle fusion. A corresponding transient lateral diffusion of ^-cadherin is seen postsynaptically within the expanding spine heads of three-week cultured neurons with this manipulation, consistent with a functional coupling of pre- and postsynaptic ^-cadherin following neurotransmitter release25,54. Biochemical evidence demonstrates an activity-dependent increase in ^-cadherin dimerization and an increased resistance to trypsin digestion that is NMDA receptor dependent25. Hippocampal slices in which LTP has been induced also show increased levels of ^-cadherin dimers48. Thus, cadherins appear to be stabilized at active glutamatergic synapses. These findings also suggest that cadherins could become sensitive to the actions of endogenous proteases, particularly at sites with active neurotransmitter release and relatively little NMDA receptor activation, such as some GABAergic synapses or depressed glutamatergic synapses. This possibility may explain the loss of ^-cadherin from GAD65-positive hippocampal synapses or thalamic terminals in somatosensory cortex during development28,55. It also may partly explain the persistent loss of E-cadherin expression in nonpeptidergic C-fibers following spinal axotomy56. Potentiation, on the other hand, produces a protein synthesis-dependent increase in synaptic ^-cadherin in juvenile CA141, consistent with its deployment to strengthened sites.